Lord Vishnu: One of the main deity in Hinduism and the only who has taken more number of avatars or incarnations to save his devotees and to kill demons and to establish dharma and demolish devils. Lord Vishnu has taken different avatars in different Yugas. 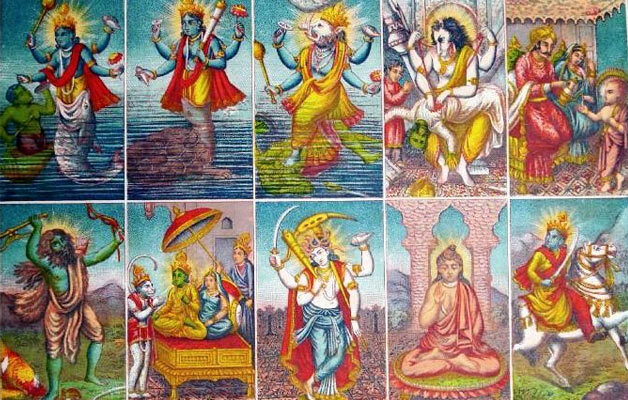 Lord Vishnu has already taken 9 avatars on earth and the remaining only avatar is Kalki avatar. Vishnu Kalki avatar will come at the end of Kali Yuga. Ten avatars of Vishnu is also known as Dashavatar. Dasavatharam of Lord Vishnu has different names in different avatars. Every avatar has been taken by Lord Vishnu for the specific reason to accomplish and fulfill on earth. Let me produce all the names of 10 avatars of Vishnu and their stories. Read and enjoy the grace of Lord Vishnu. Vishnu avatar Matsya is nothing but the Fish avatar. It was the first avatar of all Dashavatar. Lord Vishnu took this avatar in Satya Yuga to rescue all humans and species on the earth named as Manu as per Hinduism. There was a great flood covering the earth. Lord Vishnu took the Matsya avatar and rescued Manu. This is the story of Matsya avatar. Vishnu avatar Kurma was nothing but the Tortoise avatar. It was the second avatar of all Dashavatar. Lord Vishnu took this avatar in Satya Yuga. There was a time when Demons and Gods were churning the ocean in order to get the Amrutham which would give immortality to those who drink it. They used Mountain Mandara as churning staff. When they were churning it, mountain began to sink in the water, then Lord Vishnu took the Kurma avatar to hold the weight of the mountain on his back. This is the story of Kurma avatar. Vishnu avatar Varaha was nothing but the Boar or wild Pig avatar. It was the third avatar of all Dashavatar. Lord Vishnu took this avatar in Satya Yuga. There were two demons named Hiranyakashipu and Hiranyaksha. Hiranyaksha attacked the heavens and troubled all gods. He kidnapped goddess earth and took to the bottom of the cosmic ocean. Lord Vishnu took the Varaha avatar to rescue the goddess of earth. He defeated and killed Hiranyaksha and carried the Earth from the bottom of the cosmic ocean to top and restored earth in the universe. This is the story of Varaha avatar. Vishnu avatar Narasimha was nothing but the Lion Man avatar. It is the fourth avatar of all Dashavatar. Lord Vishnu took this avatar in Satya Yuga. Hiranyakashipu's son named is Prahlada, who was the greatest devotee of Lord Vishnu from the childhood but Hiranyakashipu hated Vishnu. So he tried to kill his son because he was not able to stop Prahlada from praying Lord Vishnu. Lord Vishnu saved so many times Prahlada but he got so much anger and finally took Narasimha avatar and came from the pillar and hold the Hiranyakashipu on his thighs and killed him with his claws. This is the story of Narasimha avatar. Vishnu avatar Vamana was nothing but the Dwarf avatar. It was the fifth avatar of all Dashavatar. Lord Vishnu took this avatar in Treta Yuga. Once upon a time, there lived a king named Bali who was the grandson of Prahlada and the son of Virochana. He was able to defeat Indra and can extend his power and kingdom to all three worlds. All gods requested Lord Vishnu to help from Bali. Then Lord Vishnu took the Vamana avatar. Vamana went to Bali and asked for three boons and Bali promised that he will fulfill them. Vamana asked three boons as three pieces of land. Vamana transformed into giant shape and put his first step on Heaven and the second one on Paathala. There was no space for third step, so Bali offered his head as the third step. Then Vaman put his foot on the head of Bali and crushed him into the underground. Vishnu made Bali as king of Paathala and also granted him immortality. This is the story of Vamana avatar. Vishnu avatar Parashurama was nothing but the warrior who has an axe in his hand to destroy bad people. It was the sixth avatar of all Dashavatar. Lord Vishnu took this avatar in Treta Yuga. Parshuram was the son of Jamadagni. He was regarded as first Brahmin-Kshatriya. Once a king named Kartavirya Arjuna visited ashram of Jamadagni and Jamadagni fed him with the milk of his cow Kamadhenu. King Kartavirya became greedy and asked Kamadhenu but Jamadani refused. Then Kartavirya attacked ashram and took away Kamadhenu. When Parashurama came to know about this he killed Kartavirya and brought back the cow. Then three sons of Kartavirya killed Jamadagni. When Parsuram came to know about his father's death, he became angry and killed those three sons of Kartavirya Arjuna and made the vow that he would kill every Kshatriya on earth. This is the story of Parashurama avatar. Vishnu avatar Rama was nothing but the Lord Rama avatar as the king of Ayodhya and son of Dasaratha. It was the seventh avatar of all Dashavatar. Lord Vishnu took this avatar in Treta Yuga. 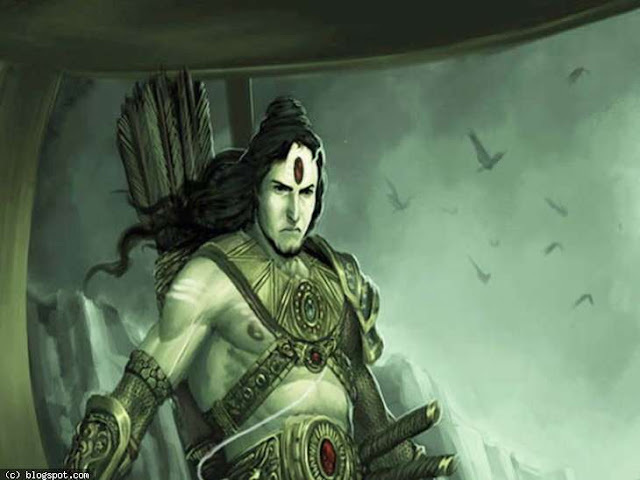 Lord Rama was one of the most powerful avatars along with Lord Krishna. Lord Rama was the powerful king and god who married to Sita, who was a goddess, Lakshmi. Rama killed Ravana in Ramayana and destroyed evilness in Treta Yuga in the end. Lord Hanuman was the greatest devotee of Lord Rama who is still alive on the earth as Chiranjiv. This is the story of Rama avatar. Vishnu avatar Krishna was nothing but the Lord Sri Krishna god avatar. It was the eighth avatar of all Dashavatar. Lord Vishnu took this avatar in Dvapara Yuga. This is the only avatar of Lord Vishnu in Dvapara Yuga. Lord Krishna was one of the most powerful avatars along with Lord Rama. Lord Sri Krishna was the eighth son of Vasudeva and Devaki. He stands as a symbol for love, naughtiness, and mischievousness. Lord Krishna born to kill his uncle Kamsa who was the cruel demon who killed so many kings and prisoned them in prisons. Lord Krishna killed so many devils and demons sent by his uncle to kill him. Finally, Lord Sri Krishna killed Kamsa and made his uncle Ugrasena as the king of Mathura. Lord Krishna stood alongside the Pandavas in Mahabharat and rescued them throughout their lives. This is the story of Krishna avatar. Vishnu avatar Buddha was nothing but the Gautham Buddha avatar. It was the ninth avatar of all Dashavatar. Lord Vishnu took this avatar in Kali Yuga. Gautham Buddha was regarded as the greatest sage and monk. Buddha actually born as the king named Siddhartha. He later became a monk by attaining enlightenment under the tree. Gautham Buddha was born to bring change among human beings and to show them the right path to live in their lives. Gautham Buddha succeeds to change people minds through his philosophies and speeches and made them live with peace and non-violence. This is the story of the Buddha avatar. Vishnu avatar Kalki was nothing but the horseman who has the sword in his hand. Lord Vishnu will take this avatar at the end of Kali Yuga. It is the tenth avatar of all Dashavatar. Lord Vishnu will take this avatar in Kali Yuga. Kalki will come on white horse and sword in his horse. He will take birth to destroy evils and unrighteousness at end of the Kali Yuga. He will remove all the darkness of Kali Yuga. Parshuram is going to teach warfare skills in his childhood. This is the story of Kalki avatar. This is all about the 10 Avatars Of Lord Vishnu And Dasavatharam Stories. If you like the story then share with your friends.